The easy pour spout is not a safety device! It enables you to add fragrance to a lamp by simply lifting the burner top and inserting the filling tube to add additional fragrance. Do not do this if your lamp is burning. 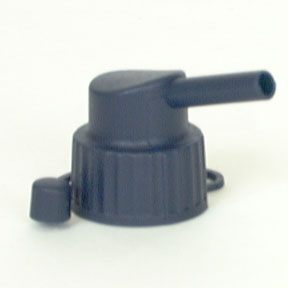 The Easy Pour cap will fit both Lampe Berger liters and half-liters. Remove the fragrance top and screw down the Easy Pour Cap by grabbing the gnarled base of the cap and tightening it to make a good seal. Do not use the spout as a lever for tightening the cap as it could break off!